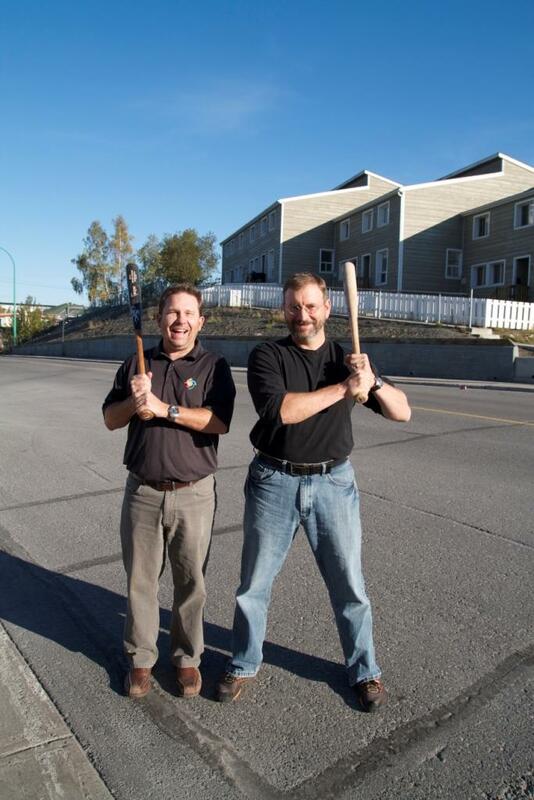 Tournament organizers Rob Johnson and Vince Barter: ready for battle. James McCarthy: So, Rob please fill me in on how the idea of this wood bat tournament came about? Rob Johnson: Well, as you know there have been a few of us fastball players who have been using wood bats on and off for the past few seasons. For me personally it became an interest in bringing back aspects of the game that have gone way to expensive composite bats. These bats serve a purpose but they have allowed players to become reliant on the “pop” of a bat over hitting technique to get on base or send a long ball to deep centre field. A tight inside pitch with a composite or aluminum bat can lead to a ‘bloop’ single but with a wood bat the story is different often leading to a cracked or broken bat. With a wood bat the art of hitting comes to the surface in a hurry. Getting back to your question, it started with the fact that a few of us introduced wood bats into our league and we have been looking for ways to have other players give them a try. In conversation with one of my teammates Vince Barter he raised the idea of how we might introduce wood bats to the league in a fun way. His thinking was what about a fun all wood bat tournament at the end of the season when players are not concerned about winning games or a league championship? Shortly after he had proposed this idea other members of the league suggested a fun tournament at the end of the regular season where we would have a fantasy draft and ‘mix up’ the league a bit, all in an effort to raise a few dollars for our league. It seemed obvious that we could mix the two ideas and after Vince and I canvased league executives members , team reps and players alike we were in business. JM: I understand that the Fantasy Draft was held last Friday evening at the Curling Club. Was the turn out what you had hoped for and how many teams should we expect to see at Tommy Forrest this weekend? RJ: It was a huge success two of the regular season teams actually decided to treat this with some class and arrived wearing suits and ties. One of the teams actually arrived in a limo. Everyone had a blast and it’s events like this that only make our league stronger and closer. Rumour has it that this will become an annual event with players bringing guests to this event it will most likely replace our typical year end party. The interesting thing about the draft and the tournament itself is that it has peaked a lot of interest outside of our league. I have had non-fastball players approach me in person or via email/text. What came out of this interest is that we have a few new players using this tournament as a fun way of getting introduced to the league. As far as numbers goes we have a total of 50 players divided among 4 teams. Players were drafted by a pair of co-captains from each team made up of a pitcher and a catcher. I think this is a great turnout and it goes to show how much fastball is alive here in Yellowknife. JM: Rob, this all sounds great. Ok, so you have the interest and the teams are picked, but where do all the wood bats come from? JM: Rob all of this sounds very interesting and a lot of fun. For those readers out there that might be interested in watching some fastball this weekend and hearing the “crack’ of a wood bat will there be the usual set-up down at the field with food and beverages available? JM: Rob, I almost forgot. You had mentioned that the idea behind this fun tournament was to also try to raise some funds for the league can you be a bit more specific? RJ: James as you know over the past few years we have been working hard to make improvements at the diamond and I think everyone can say that it shows. We have been working with the City of Yellowknife as well as the Green Diamond Project Association (GDPA) and local businesses to remove old bleachers, replace tired dug-outs and generally make the diamond a safer and more attractive outdoor community facility. We see proceeds from the tournament to go directly back into these types of initiatives. For us it’s not only about keeping the game alive but making a facility that continues to be more accessible to other user groups. Just to give you an example, a few years ago an idea was pitched out there to have an outdoor rink on Tommy Forrest during the winter. Well, this has been a huge success and from what we understand the City will be continuing with this initiative again this winter. JM: Rob, any last thoughts before we bring this interview to a close? RJ: Yes, I would like to thank the league executive and players alike for supporting this tournament. I would also like to thank our league sponsors who continue to support us year after year. Our current sponsors include: Sub Artic Surveyors, Slades Mechanical, Home Building Centre, Nexum-Carl’s Carpet Cleaning and Alanco. JM: Rob, thank you for your time and good luck with the tournament. RJ: No problem and I hope to see you down at the diamond over the weekend.